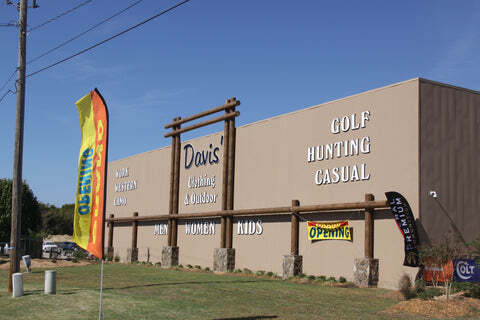 One retailer that we are proud to work with is Davis Clothing and Outdoor, located in Bossier City, Louisiana. This family owned store's history reaches back four generations. In 1902, the store was founded by William Hamilton Davis in Shreveport, Louisiana as "W.H. Davis General Merchandise", where they sold work clothes, shoes, hats, and tobacco. The store Davis built had a second floor with living quarters, and that is where his family lived until his death in 1951. Today, the store is owned and operated by brothers Lee and BJ Davis. To the right, we have a photo of Lee Davis, alongside Steve Koppman of Grand River. In early 2015, the Davis brothers built a new 25,000 square foot retail/warehouse location in Bossier City, Louisiana and rebranded the business as Davis' Clothing & Outdoor. Davis' features regular size men's clothing, plus the largest selection of Big & Tall men's clothing in the Ark-La-Tex. In addition, Davis' also stocks sporting goods, work wear, western wear, golf apparel, casual clothing, outdoor clothing for fishing, hiking, hunting, and camo clothing. Would you like to learn more about Davis Clothing and Outdoor?